On my way at last! 13 April 2016 The frozen Arctic Ocean Elevation: 1m Latitude: 88°14’16″N Longitude: 131°24’02″E Weather: Sunny Temperature: -25°C Distance covered today: 14.8km Distance to North Pole: 133km Ed is feeling: Happy tired Fantastic to be finally here on the Arctic sea ice heading to the Pole! Bit of an odd day as we were helicopter dropped at our start point at 6:30am ski-trekked a while then camped and had dinner and a sleep (our first in 28hrs!) before carrying on for a few more hours. We are completely self-sufficient now and like ants in a vast white land. It is stunning and flipping cold! We have seen polar bear foot prints and lots of fox tracks and a poo (which we have collected for scientific research purposes, nobody knows what they eat this far north). 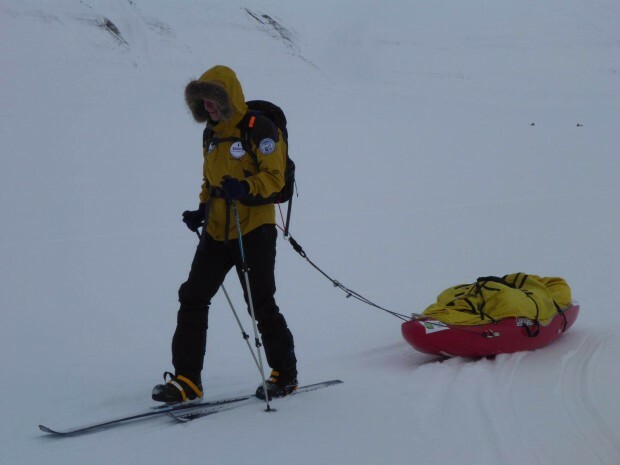 Progress has been good but it is really tiring, crossing broken ice pressures ridges and luckily so far the sea ice cracks we have been able to step over with our skis. Here we go! The next stop the high Arctic sea ice. Sunset from last night. Equally impressive tonight but no time to photograph! 12 April 2016 Longyearbyen, Svalbard Elevation: 51m Latitude: 78°22’32″N Longitude: 15°62’67″E Weather: Snowing Temperature: -10°C Distance covered today: 0km Distance to North Pole: 1316km Ed is feeling: Emotional The sleds have been weighed and transferred to the airport and the first technical flight has successfully landed at Camp Barneo. The Antonov-74 has turned around to come back to pick us up!!! We are wildly excited and nervous and will soon be on the high Arctic sea ice. Thank you all for you good wishes and support during the long wait in Longyearbyen. The time has come. I have had the most incredible 8 months thanks in a huge part to the people I’ve met on this most incredible of journeys. Time for talk is over it’s time for doing. 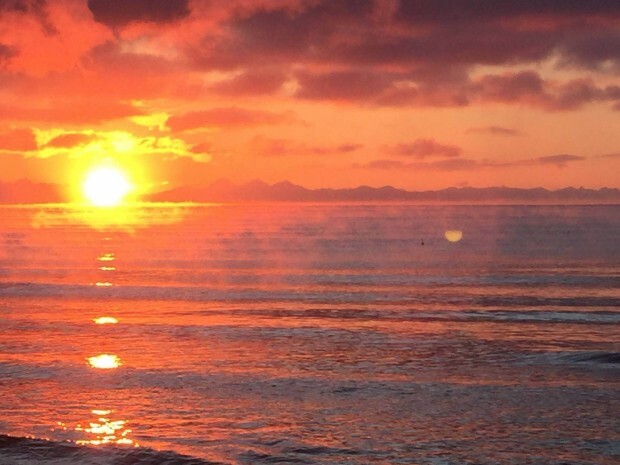 The North Pole is calling…. 11 April 2016 Longyearbyen, Svalbard Elevation: 51m Latitude: 78°22’32″N Longitude: 15°62’67″E Weather: Snowing Temperature: -13°C Distance covered today: 0km Distance to North Pole: 1316km Ed is feeling: Excited The Russians have pulled off a miracle and have a runway at Camp Barneo which will accept the first technical flight of cargo first thing tomorrow morning. Assuming this goes well we will be on the first passenger flight some 7 hours later. This feels different to the other false dawns! 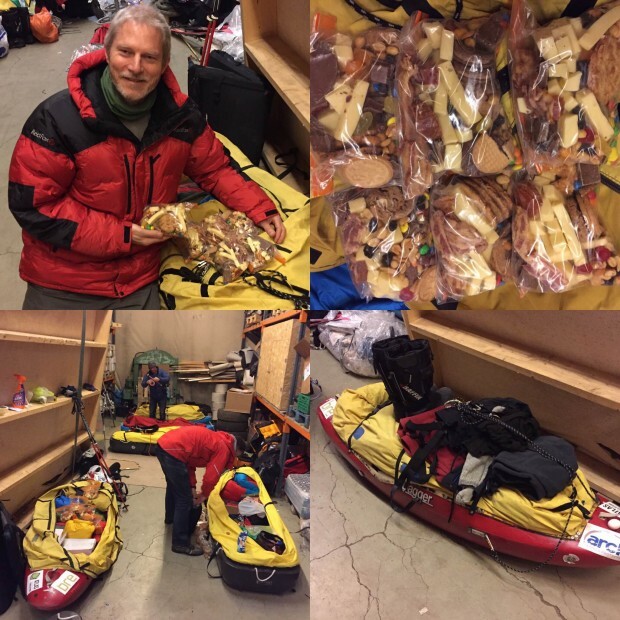 We have repacked our pulk sleds today and I have spent a good deal of time making 16 day snack bags (the stuff we eat on the move). These are an energy packed mix of cookies, peanuts, dried fruit, salami, crispy bacon, cheese, sweets and chocolate! Yum! This is a really exciting time tinged with some unease as we know we do not have time to complete two degrees. 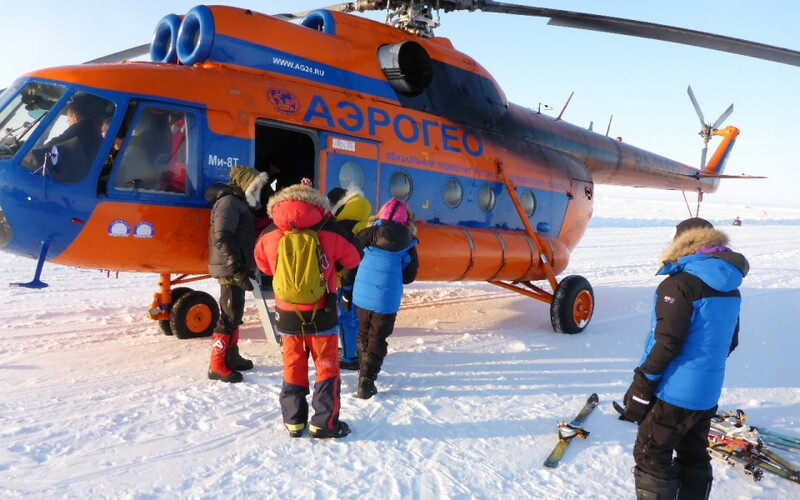 This is a very poor season for Arctic sea ice and as a result a very short season for Arctic adventures like ours. I will post again from my iPhone tomorrow but from then on all comms will be through the Iridium Go! satellite modem we use on the ice. What a day! 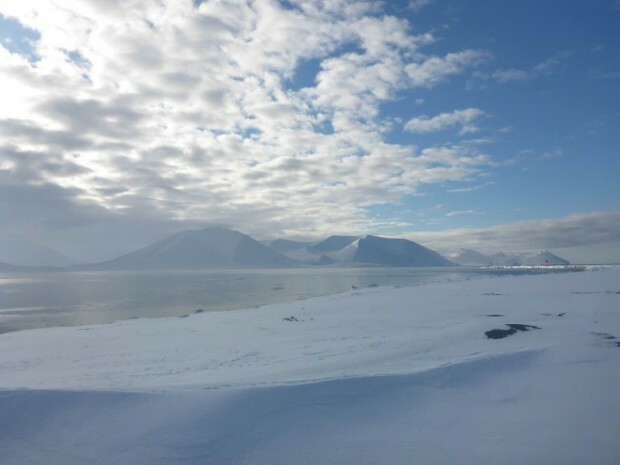 9 April 2016 Longyearbyen, Svalbard Elevation: 51m Latitude: 78°22’32″N Longitude: 15°62’67″E Weather: Snow showers Temperature: -8°C Distance covered today: 0km Distance to North Pole: 1316km Ed is feeling: Calm A day of news from Barneo where a third runway site has been identified 27km away from the two abandoned runways. Work is underway on transport to the new location with an IL-57 plane on its way “Airdrop at Barneo went well: 17 cargo platforms were dropped. Now we don’t worry for people and equipment. It’s -38*C at the ice camp. Trailer with tractor has covered 600km (of 2,300km). 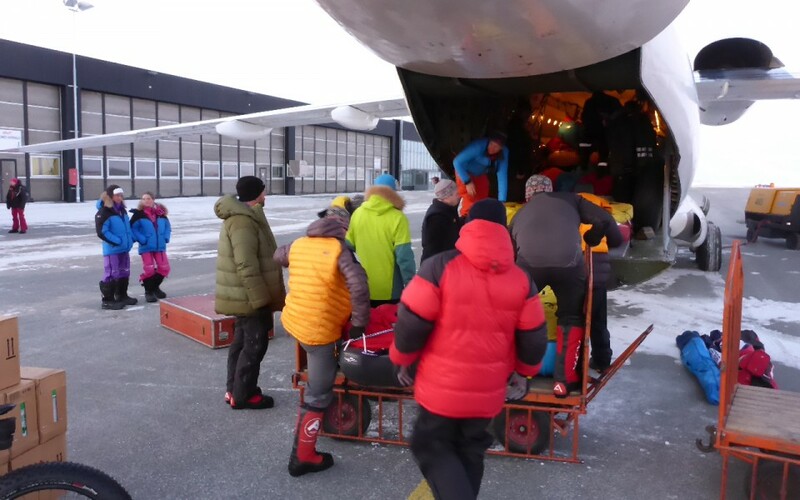 AN-74 returned back to Longyearbyen from Murmansk.” The AN-74 is the plane that will take us north. We wish the Russians speed and strength in their endeavours and patiently wait for more news. Meanwhile we remain positive and keep active. Realistically we are many days away from departure. The Trappers Trail are back in town after their overnight as are team mates Rob and James. 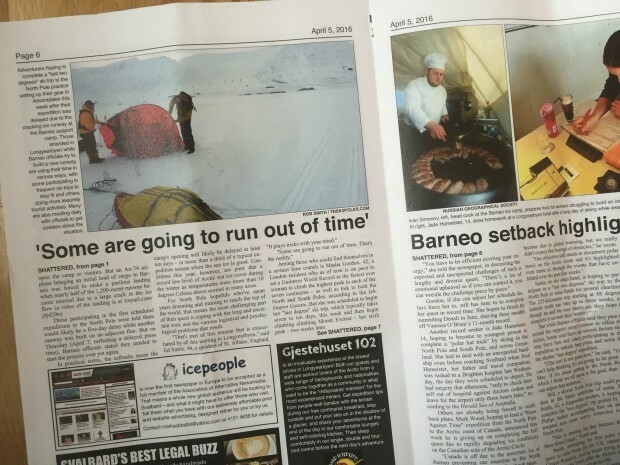 We are featured in the Svalbard Icepeople publication as the cracked runway and its knock on effects are the main story of the week. The picture is me attempting to put a tent up with Keith! 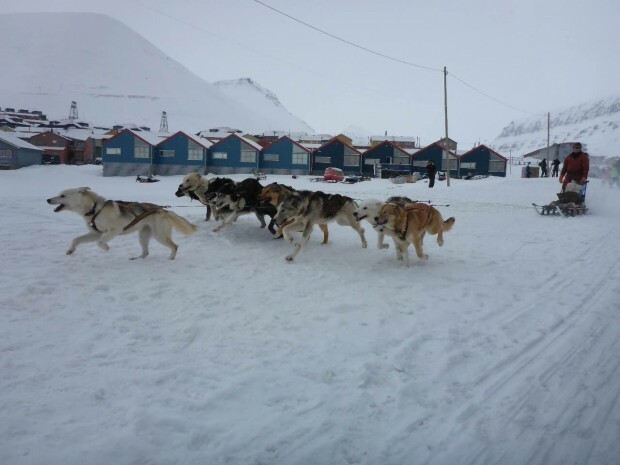 9 April 2016 Longyearbyen, Svalbard Elevation: 51m Latitude: 78°22’32″N Longitude: 15°62’67″E Weather: Snowing Temperature: -6°C Distance covered today: 3km Distance to North Pole: 1316km Ed is feeling: Wooftastic The Trappers Trail 2016 dogsled race got underway today with a record number of team entries. Chatted to a local teacher who’s a musher and he says “we talk for half of the year about who is going to win!” A very exciting and noisy event that was even being filmed by the BBC this year. Our North Pole team remain positive and busy. Went for a ski without the pulk sled and fair zoomed along! No news on the runway but many are taking this as a good sign. We also have 54 polar marathon runners in town and the Oslo Symphonia so hotel rooms are getting harder to find! 7 April 2016 Longyearbyen, Svalbard Elevation: 51m Latitude: 78°22’32″N Longitude: 15°62’67″E Weather: Snowing Temperature: -4°C Distance covered today: 0km Distance to North Pole: 1316km Ed is feeling: Chipper More unwelcome news as the Russians are now searching for a third location on which to construct the Camp Barneo runway. The second site proved too fragile and has cracked beyond repair. There are climatic perturbations but I feel we are directly witnessing the impact of climate change on the high Arctic. The general trends for ice coverage and ice volume over the last 30yrs are a decline. I am planning on recording actual sea ice thickness data when I’m on the ice to help supplement satellite data. 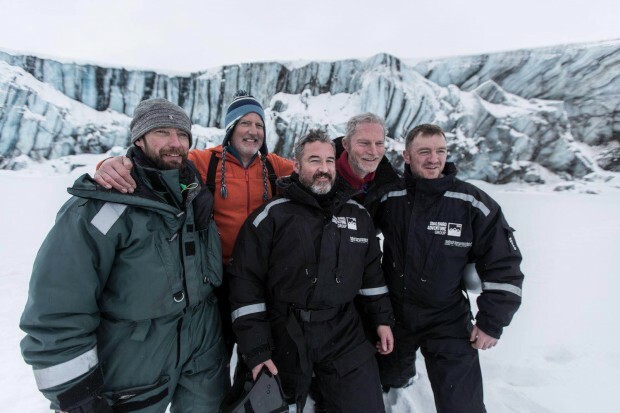 Eric Philips one of the worlds most experienced polar guides informs us this has happened before and we remain confident of reaching our goal. Have moved hotels again as extending bookings is getting tricky (especially as 54 competitors in the Polar marathon have now arrived in town!). We send good wishes to the Russians working day and night on the ice. Also I hugely appreciate the words of support and encouragement coming through on social media they are truly uplifting, thank you.